Frog legs are a popular meat in many parts of the world including South America, Asia, Europe, and the Southern United States. It is true what they say that frog actually has a lot of the same flavor and texture characteristics as chicken. Typically frog meat is a little more light and tender than chicken, but chicken does provide a good comparison if you intend to smoke some frog legs for guests who have never tried them. Smoking frog meat does bring out some unique flavors compared to the traditional way of frying it. We recommend dipping your smoked frog meat in a little hot sauce to really accentuate the flavor. Smoked Frog Legs - This smoked frog legs recipe will surprise your taste buds. 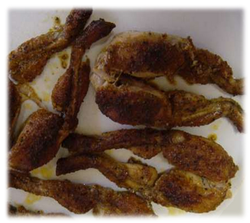 The smoke on your frog legs, paired with the rub seasonings, make this a delicacy you will want to try again and again.